Glass Bottles feature stainless steel caps that prevent liquid from spilling or leaking. The airtight lids ensure that the bottles are leak-resistant, making them ideal for an on-the-go lifestyle. 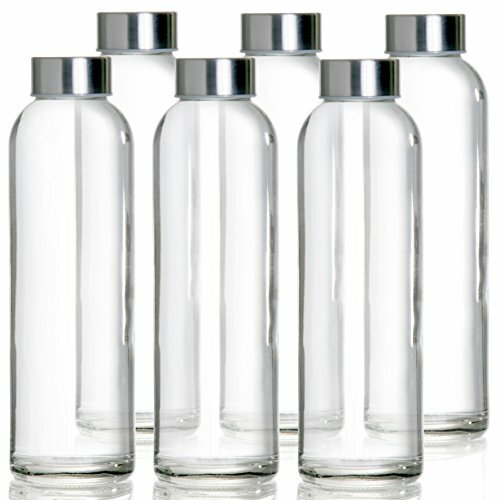 SAFE & SANITARY: The bottles are made of pure glass, which is BPA-free and absolutely safe to drink from. Quench your thirst with the satisfaction that your drink is free from chemicals or toxins. The glass bottles are dishwasher-safe and refrigerator-safe. Perfect for water, juice, and other beverages. *NOTE: Do not use for hot drinks. SLEEK & COMPACT: We have crafted the bottles with a slim design, making them portable and easy to use. The bottles fit into tight storage spaces such as lunch bags, cup holders, refrigerators, and anywhere else in your kitchen.